Preheat oven to 350. Line a baking sheet with parchment paper. Place the eggplant slices in single layer. Bake for 10-15 minutes or until they are soft and cooked through but not browned. Allow to cool slightly. Turn the oven up to 400. In a medium bowl, mix together the ricotta, basil, oregano, salt, pepper, Parmesan, and mozzarella. Divide the dough into 8 equal chunks for individual (about hand sized) calzones or 4 equal chunks for larger calzones. Roll each one into a 5-6 inch round. Add a single layer of fennel and then 2 (or 4) tablespoons of the cheese mixture and top with slices of eggplant in one half of each round, leaving a 1/4 inch border. Fold the dough over to form a half moon shape and pinch shut. Repeat until all are filled and pinched shut. Bake on a pizza stone or on baking sheets for about 20 minutes or until golden and hot all the way through. Serve immediately. 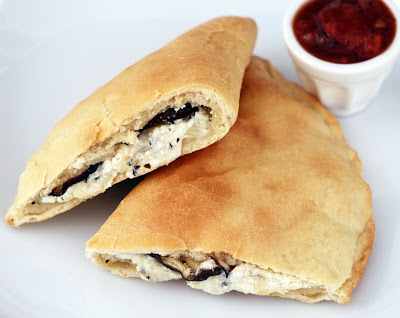 Refrigerate leftover calzones in an air tight container or resealable bag overnight. To reheat: allow them to sit on the counter while the oven preheats to 350. Bake until cooked through. I found some lovely Italian eggplants and a pristine bulb of fennel at, of all places, H Mart, and immediately began trying think of interesting and new ways to use the two together. I can't say that calzones leapt immediately to mind but I had ricotta and mozzarella and of course, flour and yeast so I thought I'd give it a shot. I am glad I did, it was so good! Slightly more upscale and subtle and the usual calzone. I discovered the baking the eggplant trick when I was developing recipes for my upcoming cookbook and it really does result in a velvety texture in the final dish. The fennel stays somewhat crisp but not so crisp that when you bite into it the fennel falls out of the calzone and burns your chin. Heat oil in a nonstick pan. Saute the pork until just browned. Add to a 4 quart slow cooker. Add all remaining ingredients. Stir. Cook on low 8 hours. Stir prior to serving. I like to sprinkle it with a bit of sharp cheddar and diced onions when I serve it. I don't know about you but I am so tired of winter. A lot of it comes from having two blizzards in less than a week and living in a city that just doesn't plow the side streets making it impossible to leave. I have to admit, even in a "good year" I don't enjoy snow or winter very much. Pretty much the only "cold weather" food I can stand to see right now is chili. No matter how many times I make it, I can always enjoy chili. 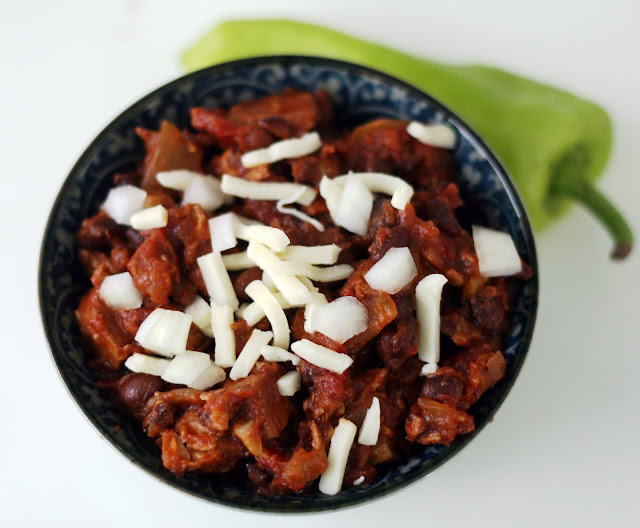 This variation uses my favorite mild but peppery chile, the cubanelle and a mixture of spices for a chili that is not terribly hot but not so mild that spice lovers would turn up their noses at it. 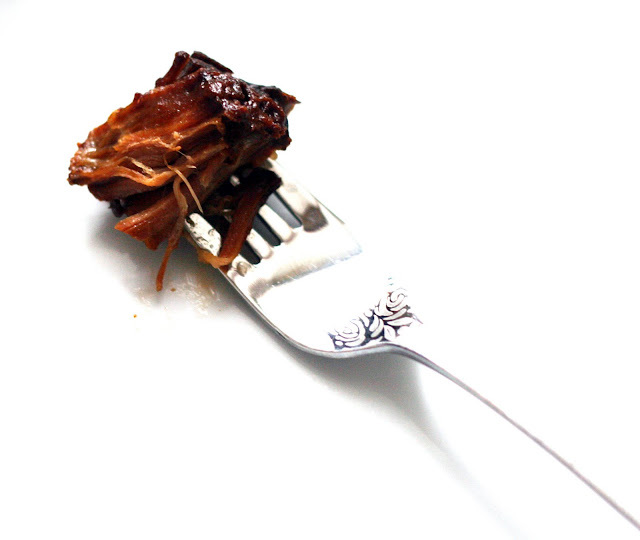 Since it is made in the slow cooker, it can not be easier to make. I measure out the spices and stick them in the (unplugged) slow cooker overnight and chop all of the vegetables and refrigerate them overnight as well so all I have to do it saute the meat and add the remaining ingredients to the slow cooker in the morning. Easy peasy. In a large pot, heat the olive oil. Add the onions and celery and cook until the onions and shallot are soft and translucent. Do not let them brown. Add the cauliflower, spices and 2 cups stock. Bring broth to a boil, stirring occasionally. Reduce to a simmer and cook 20-30 minutes or until the cauliflower is tender and easily cut, stirring occasionally. The broth will not totally cover the cauliflower but don't worry- stirring will be enough to ensure the cauliflower cooks through. Using a regular blender or immersion blender, blend the cauliflower mixture until very, very smooth and creamy. If you are using a regular blender, you will probably have to do this in steps so pour the blended soup into another large pot as you go. If using an immersion blender, you can blend the soup right in the same pot. Once blended, add the milk, remaining stock, vinegar and broccoli. Return to heat and allow to simmer until the broccoli is fork tender. Pulse the blender until the soup is mostly smooth. Stir in the cheese and serve. I love the idea of broccoli-cheddar soup more than I actually like the soup itself. It is just a little too rich for me. I've seen "light" versions of the soup but they all seem to call for reduced fat cheese (blah) or using milk which I think makes the soup too thin. I remembered how creamy this cauliflower soup was that I made (could it really be four years ago?) and posted. That soup was rich and creamy but the body of the soup came from the cauliflower, not heavy cream. 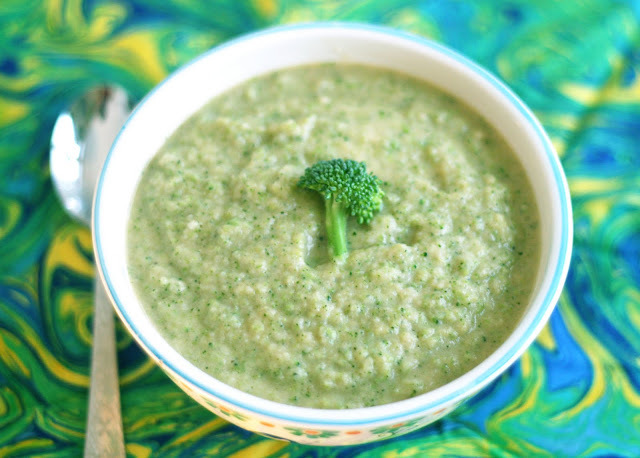 Why couldn't I use pureed cauliflower as a base for a broccoli soup? I experimented and I have to say, the results were great. The cauliflower blends into a smooth, creamy soup that has a rich, thick mouthfeel without the need for heavy cream and unless you were told, I don't think most people would guess that the "secret ingredient" was cauliflower. The broccoli and cheddar flavor is much stronger and of course complements each other just as it does in the full fat versions. Preheat oven to 350. Mix all ingredients EXCEPT the cheddar cheese until they are evenly distributed. Or, if you are like me and you hate mincing yet don't want any chunky shallot bits in the final dip or want make sure the ingredients are fully incorporated, place all of the ingredients EXCEPT the cheddar and crab in a food processor and pulse until smooth. Then stir in the crab. Spread into a 8x8 inch baking dish. Sprinkle with the cheese in an even layer. For bonus points, shake a bit of Old Bay on top of the cheese. Bake for about 15 minutes or until the cheese is melted and bubbling. 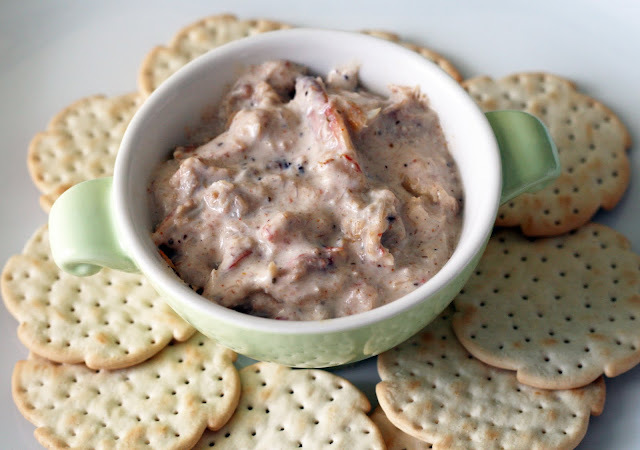 Serve warm with crackers, pretzels, bread wedges, or plain Utz chips. Cover and refrigerate any leftovers. Bake @ 350 for 10 minutes or so to reheat. I don't recommend microwaving. Note: For this recipe, quality reduced fat sour cream and cream cheese will work just fine. Crab dip is serious business here in Baltimore. We are a people who like our (blue) crabs and our cheesy dips. Growing up, my family didn't do much in the way of entertaining and well, crab is pricey so we didn't make it but I loved having friends whose families would make it for holiday parties and such. Of course, it has been on the menu of nearly every locally owned restaurant and pub at some point or another. I think if it doesn't make an appearance on the menu at least once, your food permit gets yanked. Anyway, for the perfect crab dip you need, crab, some sort of combination of cream cheese, mayonnaise (or occasionally straight mayonnaise, no cream cheese), shredded cheese and lots of Old Bay. 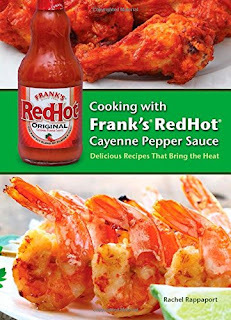 Beyond that I've had versions with garlic or garlic powder, onions or shallots, mustard, Parmesan cheese, and crab meat of every variety of from lump to backfin. I like to use claw because it has a flavor that is stronger than lump meat (but still sweet and not "fishy") and has a good mix of big chunks and smaller bits of crab. I like how the crab is distributed in the dip if you use claw or even backfin, with jumbo or regular lump you end up occasionally getting a bite that is entirely crab free. Not a problem with the claw. When I set out to make the ultimate crab dip I had some parameters in mind. It had to be thick, creamy but not too mayonnaise-y, and spiced but not overpoweringly spicy. I am a sour cream addict so I always have to add that to my dips. I think the slight tang keeps the dip from tasting too rich or cloying. The trick is not to use too much or the crab will be spread too thin. You want a dip that is thick with crab meat. I like the crab flavor to be the star so I only put a thin layer of cheddar on the top (not mixed in as I've seen in some recipes) and just enough spices to accent the crab flavor, not overwhelm it. I always use extra sharp cheddar but a mix of cheddar and Monterey Jack (in a 2:1 ratio) is a good variation. Crab dip is so popular here in Baltimore that it actually has spawned a spin off appetizer, the crab pretzel, which isn't quite as common but perhaps it should be, it is sort of a twist on the dip in the bread bowl fad of 30 years ago and is oddly satisfying. Rub both sides of the pork with the chipotle, salt and pepper. Quickly brown on each side in a nonstick skillet. Place in a (preferably oval) 4 quart slow cooker. In a small bowl, whisk together the remaining ingredients until smooth. Pour over the ribs. Cook for 8 hours. 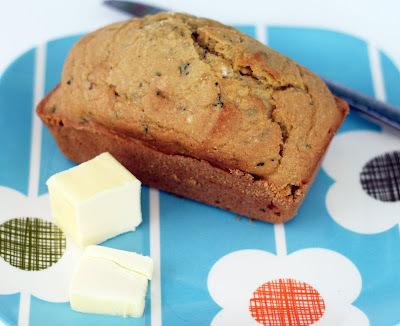 *I used yummy Spoon NYC jam which is just sugar + blueberries and has really true blueberry flavor. Preheat oven to 350. Grease, spray with baking spray or line 18 wells in a muffin tin. In a large bowl, whisk together the spices, baking powder, cocoa nibs, baking soda, flour and oatmeal. Set aside. In another large bowl, cream together the butter and sugar. Beat in the eggs and vanilla. Stir in the yogurt then add the dry ingredients. Mix to combine. Fold in the mashed banana. Divide evenly into wells. Top each with a slice of banana, if desired. Bake about 20 minutes or until a toothpick inserted into the center of the center muffin (but not through a banana slice, go in through an angle) comes out with just a few moist crumbs. Remove from the tin and cool on a wire rack. I am not much for banana flavored things (or overripe bananas for that matter) but my husband likes them so every once in a while I whip up a batch of something banana-y for him (and for which I hope I get some major good wife points because the smell of overripe bananas makes me kind of queasy) to take for breakfasts. Matt said they were the best banana muffins he's ever had! These muffins ended up being little bit "lighter" than most banana muffins, only 4 tablespoons of butter is divided among 18 muffins! Mashed banana and Greek yogurt add a lot of flavor and moisture and the butter just isn't missed at all. Matt said using the cocoa nibs was genius, it added chocolate flavor without resorting to chocolate chips so the muffins didn't taste like dessert. 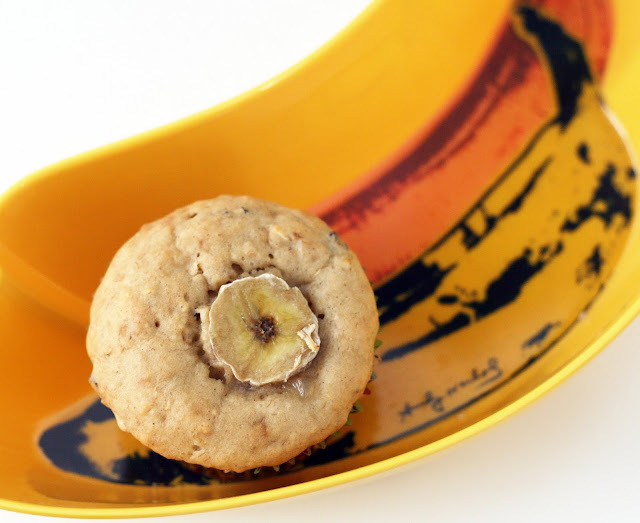 Note: If you are planning to freeze the muffins, omit the banana slice topping, it can get gummy during the defrosting. For the crust- Mix the crumbs and the butter until damp. Press firmly into the bottom of 6 4 inch springform pans or 1 9 inch pan. Set aside. In a large bowl, slowly cream together the chocolate, cocoa, sugar, cream cheese and vanilla. Add the eggs and yogurt, mix thoroughly. Pour into pan(s). Allow to sit 2 minutes, then tap the pan(s) on the counter to encourage any air bubbles to come to the surface and burst. Bake 2 hours or until the surface is mostly set- the middle inch or so might still look even less set, almost jiggly-keeping in mind that smaller pans might require less time in the oven, perhaps. Remove to the counter and run a knife or thin spatula around the edge of the pan. Allow to cool to room temperature, then refrigerate until firm. Refrigerate leftovers. When I was obsessively reading everything I could about Belgium in preparation for our trip (thankfully the Flemish sites always had a English section and I got a lot of use out of my HS french) I came across a mention that cheesecake in Belgium is often made with a speculoos crust. We didn't end up eating any cheesecake while in Belgium (too busy eating moules et frites, croquettes aux crevettes grises and our wonderful 10(+!) course meal at Patrick Devos) but I loved the idea and made a mental note to make it myself when we got back. It took a little while but I am glad I finally made it. The cookies make the perfect crust, crisp and flavorful. 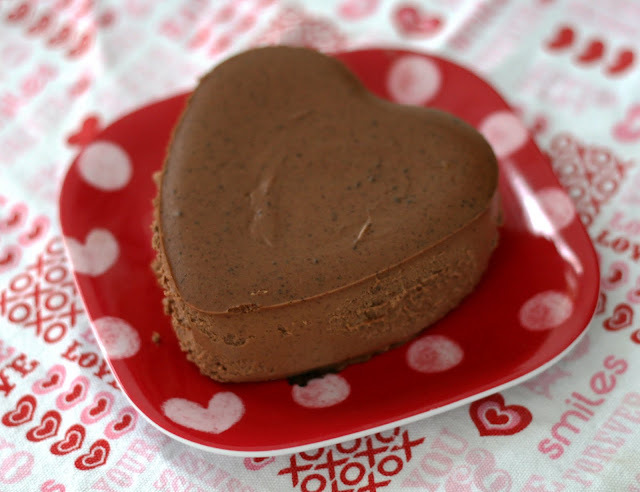 The cheesecake is really creamy and chocolate-y, not too sweet. I bet this crust would also be great with a vanilla bean or even spiced cheesecake. I may have to experiment again. Since Valentine's Day is right around the corner, I used a set of Wilton heart shaped springform pans I found at Target. I couldn't find the set online, but I found what seems to be identical pans sold individually. Preheat oven to 350. 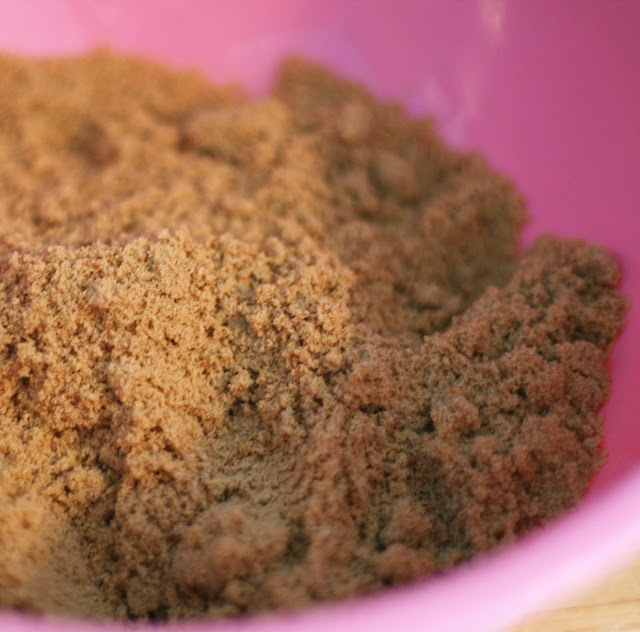 Whisk together the dry (except sugar) ingredients in a medium bowl. Set aside. Cream together the sugar and butter. Beat in the egg. Slowly mix in the dry ingredients until well combined. It will be rather thick. Roll out on a clean surface to a little less than 1/4 inch thick. 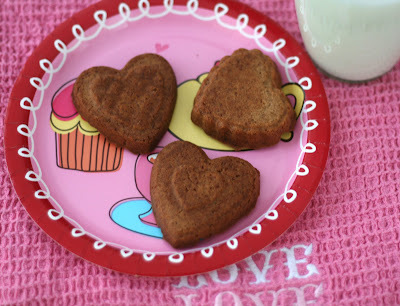 Use speculoos molds to press into shapes, a speculoos pan, use cookie cutters or just cut into squares. Alternatively, press into a cookie sheet with shaped cavities. Bake for 15 minutes or until the cookies are browned but still slightly soft in the center. Cool on wire racks. When we were in Belgium, we knew we had to check out what is possibly Belgium's favorite cookie, speculoos. Speculoos is a crisp, spice cookie somewhat similar to gingerbread. When I mention speculoos to anyone locally I am normally met with a blank stare but they actually are available here under a different name; if you have ever had a packaged Biscoff cookie, they are actually speculoos packaged for the non Belgian population by a Belgian company. Especially when we were in Bruges, speculoos cookies were at every bakery and some specialty baking shops that traditional speculoos molds to make the cookies at home. There was even speculoos spread (think Nutella but made with cookies!) in both chunky and smooth textures at every grocery store. We brought back a couple of cookie molds, a jar of the spread, some of the special sugar they use in the cookies and some speculoos from a bakery in Bruges so I could orally deduce the ingredients. A note about the sugar: you can use regular dark brown sugar but as we learned upon arriving home, Candi sugar is used in home beer making so it is actually fairly easy to locate online or in brew shops. It it is a little moister and darker than the brown sugars sold here in the US. Traditionally, speculoos is more of a Christmas or St. Nicholas Day treat but well, we are trapped here in a blizzard in Baltimore and I think that is as good excuse as any. For these cookies, I used our speculoos molds and this Wilton 12 cavity cookie pan (which is the closest thing to a speculoos molded cookie sheet that I've seen here in the US) but you could simply cut them into squares, rounds or use a cookie cutter in any shape you'd like. Cream together the Nutella, cream cheese and sugar. Beat in egg until well mixed. Fold in chocolate chips. Set aside. Whisk together flour, sugar, cocoa and baking soda in a large bowl. Add water, oil, vanilla and vinegar. Beat VERY thoroughly. Line mini muffin pans. Fill pans less then 2/3 full with chocolate batter. Do not overfill. Drop approximately 1/2 teaspoon of the filling on top. Bake on the center rack for 20 minutes or until toothpick stuck in the center of a center cupcake comes out clean. Cool briefly in the pans on a wire rack. Remove from pan and cool completely. Note: Resist the urge to use a standard sized cupcake pan, the ratio of chocolate to cream cheese filling gets thrown off and they just are not nearly as good. I love Nutella. When we were in Belgium this fall we brought back a huge "family sized" jar of Nutella. The customs people looked at me like I was crazy but it was worth it, Nutella is tastier (no HFCS) and cheaper in Europe. Last year for Nutella Day I made Nutella Cheesecake Squares which ended up becoming one of my most read/made recipes in the nearly six years I've been posting recipes here. I loved the Nutella/cream cheese combination so I decided to revisit it in a twist on the black bottom recipe my family has been making and perfecting since I was born. Or at least the early '80s. I can't remember a year when we didn't make a batch (and often, a double batch) of black bottoms at least once. These black bottoms lose a bit of their color contrast drama thanks to the Nutella, but they are so delicious, I don't think anyone will mind. I think of black bottoms as being a marriage between cupcake and cheesecake and these are no different, they just have shot of chocolate-y hazelnut-y lusciousness. I sent some home with my mother and she called three times to say how good they were and how everyone who tried them to loved them. Six dozen sounds like an insane number but they are very small and take a fair amount of effort so I don't mind making a lot. I only have one mini cupcake pan but it makes two dozen cupcakes at once so it goes pretty quickly. 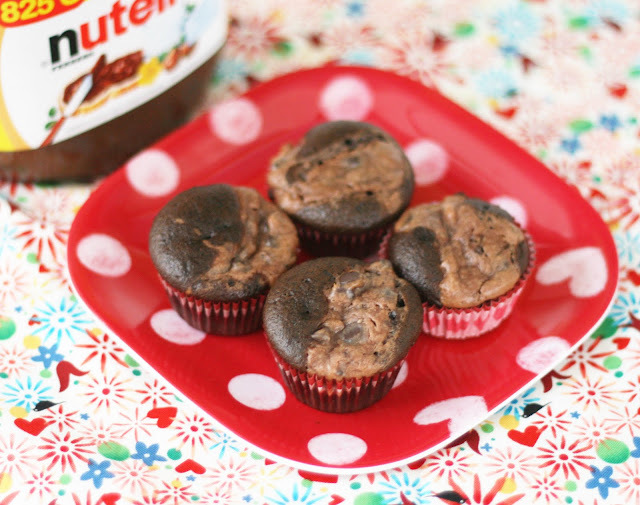 If you make them in batches refrigerate the batter and filling between batches. While the recipe can be doubled, I do not recommend halving it. Luckily, black bottoms freeze really, really well. Since we are only a two person household, I like to make a batch and freeze some in individual portions to send home with friends when they visit and for dessert emergencies. Defrost overnight in the refrigerator or on the counter. They taste best at room temperature. Preheat oven to 350. In a medium pan, melt the butter. Add the flour and spices and stir until smooth. Add the milk, mustard and evaporated milk and whisk together until slightly thickened. Whisk in the asagio until smooth. Stir in the crab meat. Pour over the drained pasta. Pour into a lightly oiled baking dish with a lid. Top with a sprinkle of panko and parsley. Bake covered about 15 minutes, then uncover and cook until hot and bubbly, about 10-15 additional minutes. Yield: 4-6 meal sized servings or about 8 side dish sized servings. 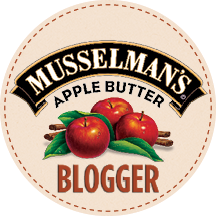 When the Wisconsin Milk Marketing Board approached me about developing a recipe using a Wisconsin cheese to share on their new Macaroni & Cheese Blog, I couldn't say no. It had been entirely too long since I made mac & cheese. I decided to use fresh asagio because it has long been a favorite. While I've had lobster macaroni and cheese before, I've never had crab. Being a Baltimore girl, this just seemed wrong. 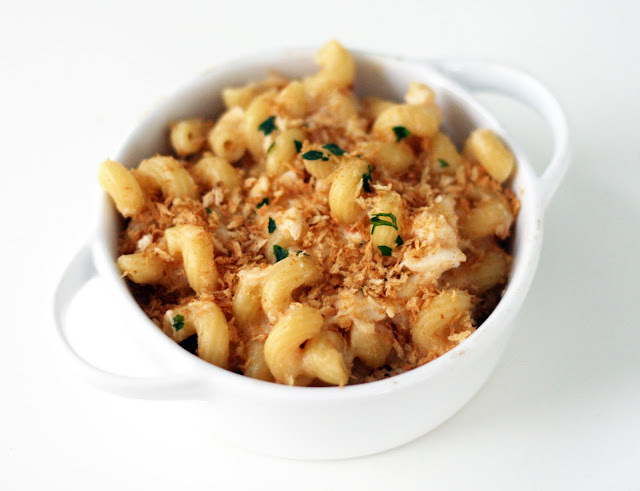 I had to make a crab macaroni and cheese and asagio seemed like the perfect cheese to pair it with, mild enough that it wouldn't overpower the crab but distinctly flavored and most importantly, it melts well. Adding smoked paprika and mustard gave it some bite and blended seamlessly into the simple cheese sauce. It ended up being a very easy but elegant macaroni and cheese. Fancy enough for company but quick enough for a weeknight. 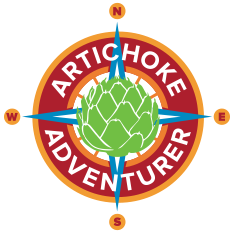 Place the cheese, cream cheese, shallot, horseradish and Worcestershire sauce in a blender. Pulse until smooth. Scrape into a bowl. Wrap tightly in plastic wrap and store in refrigerator overnight. Bring to room temperature before serving. Note: This would make a great cheese ball. Simply chill it for 30 minutes and then roll it into a ball. Roll in herbs or crushed nuts, wrap in plastic wrap and refrigerate overnight. I first made this recipe as part of our 1950s night. When flipping though vintage cookbooks and my reproduction of that masterpiece, 1950's Betty Crocker's Picture Cookbook. 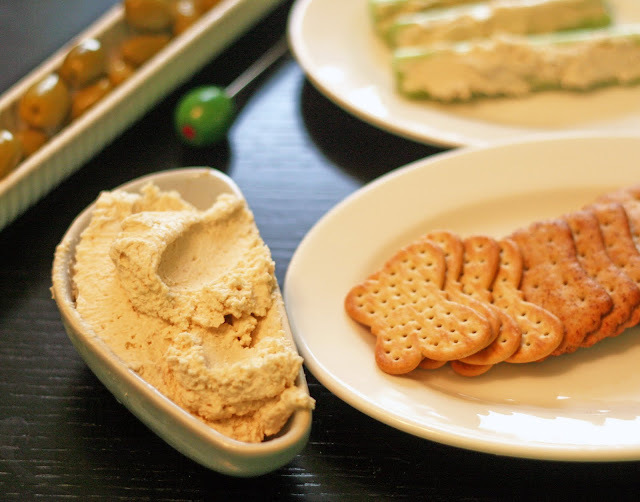 I didn't come across a recipe I particularly liked but I was pleasantly surprised by how robustly flavored cheese spreads, cheese balls and dips were. Strong mustard, cheese and horseradish were all used with great abandon. So I created a recipe that used a bunch of horseradish and my favorite extra sharp cheddar cheese. The spread is wonderful on celery sticks (as suggested by Betty Crocker), apples and of course, a variety of crackers.